Located near the beautiful Snake River Canyon, Holiday Inn Express welcomes business and leisure guests traveling through Southern Idaho. 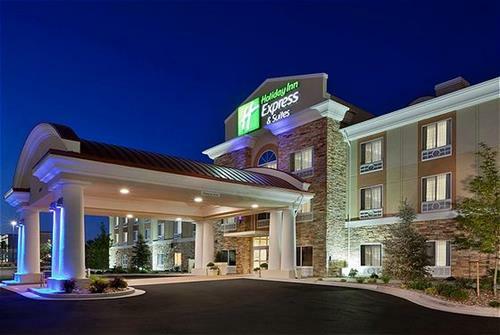 Holiday Inn Express is a preferred hotel for those coming to Twin Falls for conferences, business meetings, sports activites, and family events. Located near St. Lukes Regional Medical Center, College of Southern Idaho, and Magic Valley Mall, Holiday Inn Express is convenient to shopping, restaurants, golf courses, and convention facilities. Guests enjoy relaxing in the indoor patio area with a heated pool and whirlpool. Those who like to maintain their regular fitness routine can take advantage of the fitness room, complete with weights. The business center features widescreen monitors and wireless printer. Fax service available at the front desk. The meeting room holds up to 49 people and will accommodate multiple computer stations for training and instruction sessions. A coin laundry is also on site. Holiday Inn Express is 100% nonsmoking, and complimentary high speed wireless internet is available throughout the hotel. Guests enjoy complimentary breakfast daily. With warm cinnamon rolls and made-to-order pancakes there are options to satisfy every guests' morning dining preferences. Holiday Inn Express offers rooms with one king bed, two queen beds, or oversized suites with a sofasleeper. All rooms feature frig, microwave, and wide flatscreen television for your relaxing pleasure. In-room laptop safes are available for no charge, and each room has a coffeemaker. Seasonal golf packages available. We'll see you soon!